PNW PGA Professional Championship Entries Close Soon! 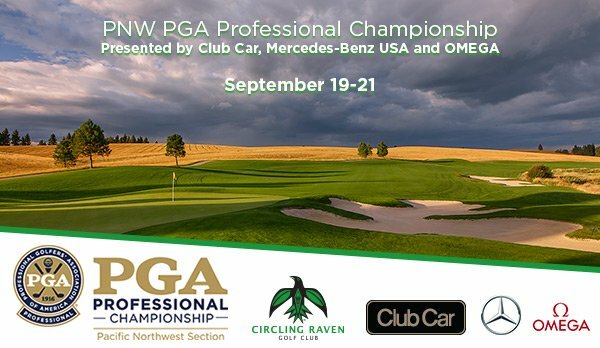 National is now accepting entries for the PNW PGA Professional Championship at Circling Raven GC on September 19-21, 2017. The entry deadline is Wednesday, September 6th at 11:59 PM. You may register for this event through PGA of America Membership Services online at www.PGA.org or www.pgatournaments.com or by phone (800) 474-2776. We use our standard major championship entry fee ($320 plus $25 for skins) for our PGA Professional Championship. This year with Circling Raven GC being a cart facility, we added in a cart fee into the entry to get to our $375 total. By going with our normal entry fee, we are able to add an additional $23,500 to the purse and we will pay up to 50% of the field. The purses for the PNW PGA Section Championship have been amazing over the years! Thanks to using our normal entry fee we’ve averaged well over $70,000 the last five years and with your participation we expect this year to easily top that mark. We already know how many spots our professionals will be playing for. To come up with the number, PGA of America calculated spots for our Championship based upon a 5-year average of the actual number of players to start their respective Championships. Also, sponsorship dollars for the Section PGA Professional Championship were calculated using the same 5-year average. We are playing for seven spots this year. Eligibility: You must be employed in one of the following classifications as of September 6 to be eligible to play in the PNW PGA Professional Championship: MP, A-1, A-2, A-4, A-5, A-6, A-7, A-8, A-9, A-10, A-11, A-12, A-13, A-14, A-15, A-16, A-17, A-18, A-19, A-20, A-21, A-22, A-23, A-24, LMA and LMMA. Advancement: The top seven finishers in our PNW PGA Professional Championship will advance directly into the 51st PGA Professional Championship, presented by Club Car, Mercedes-Benz USA and OMEGA, held at Bayonet Black Horse, Seaside, California on June 17-20, 2018. You read it right! We are excited to have the opportunity once again to return to the west coast for the second year in a row! You don’t want to miss out on your chance to advance and play in your own back yard. The PNW PGA Professional Championship will be held at our spectacular Circling Raven GC in Worley, ID on September 19-21, 2017. Host PGA Professionals Tom Davidson and Mark Nelson and his staff are excited to host this year’s championship. This beautifully designed course was built in 2003 by architect Gene Bates. It flows through 620 visually stunning and inspirational acres adjoining the Coeur d’ Alene National Forest. Wildlife is abundant, including elk, deer, moose and an occasional black bear. Circling Raven has consistently been rated as one of the top Resort courses in the country. Golf Digest and Golf Magazine Golf World have rated it in their Top 100. Only open to Section Professionals, this event draws the strongest field of PGA members in the Northwest. Last year, PGA Professional Corey Prugh of Manito G&CC won the Pacific Northwest PGA Professional Championship in a one-hole playoff against defending Champion Tim Feenstra of Broadmoor GC. Prugh made a birdie on the first extra hole for the title. Last year, seven professionals advanced to the 50th PGA Professional Championship June 18 – June 21, 2017, at our very own Sunriver Resort –Crosswater and Meadows course in Sunriver, Oregon. Watch for these players this June: Corey Prugh of Manito G&CC, Tim Feenstra of Broadmoor GC, Scott Erdmann of Oswego Lake CC, Russell Grove of College Golf Camps of America LLC, Brent Murray of Oswego Lake CC, Ryan Malby of Iron Horse GC and Bryan Tunstill of Columbia Edgewater CC.